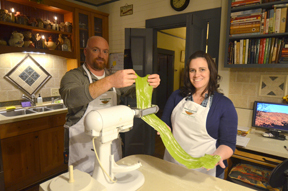 Robbie and Amy’s Cooking Class at Beechwood Inn: Amy gave Robbie a an Artisan Pasta Making Class at Beechwood Inn for Valentine’s Day last year – they just made pasta yesterday. They made Fennel Sausage Crostini, Organic Micro-Green Salad, Spinach Pasta Filled with Cheese with Organic Tomato Sauce and Raspberry Rose Petal Sorbet. Classes are led by Beechwood Inn’s Executive Chef David Darugh and are taught in Beechwood Inn’s Commercial Kitchen. Chef Darugh grew-up in his parent’s restaurant in Sonoma, California, and has studied at the Culinary Institute of America in Napa, Johnson & Wales in Providence Rhode Island, in Dijon, France and in Santa Fe, New Mexico. In addition to Chef David Darugh, his wife Gayle, the Inn’s Head Pastry Chef, will share many of her famous dessert and pastry recipes. Both have been named as “Best Chefs America 2013/2014.